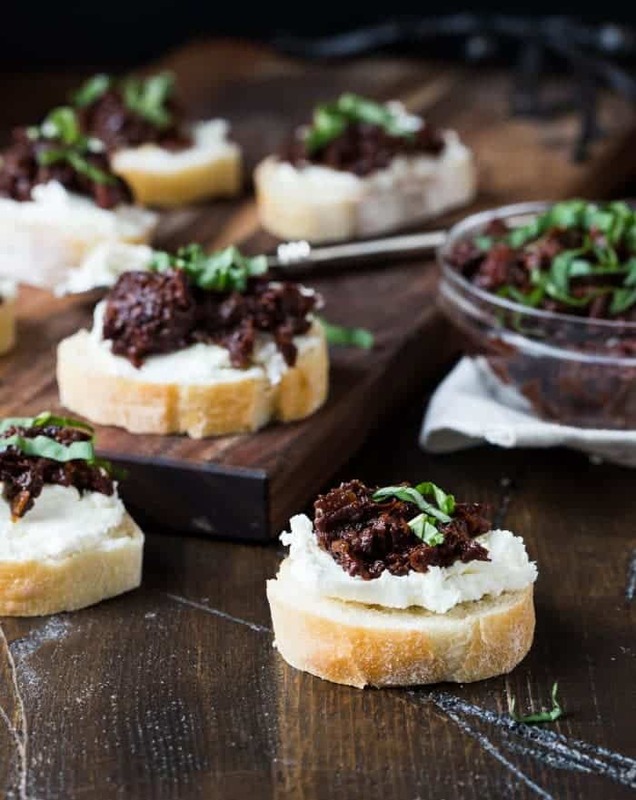 This Make-ahead Sun-Dried Tomato and Kalamata Olive Bruschetta is a tasty addition to your party menu and looks gorgeous on the buffet table! 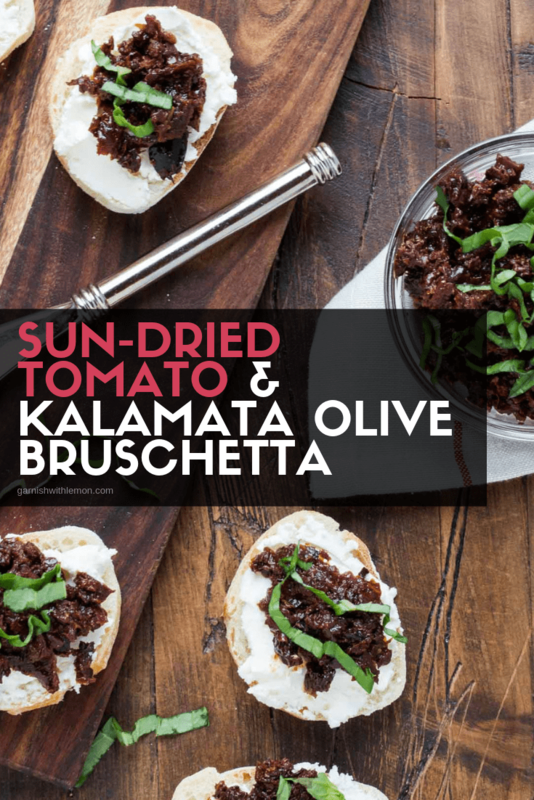 This Sun-dried Tomato and Kalamata Olive Bruschetta recipe is an oldie, but goodie. It has come and gone from my party menu rotation, but whenever I make it, I wonder why it has been so long since I have served it. It’s pretty, it’s tasty, and even people who don’t care for olives devour it. Raise your hand if you think prep time before a party is a precious commodity. Recipes that can be done ahead of time make cooking a less stressful endeavor and a party more approachable. Not to mention that extra time means you are a better hostess because you are not rushed. You are prepared, relaxed and have yummy bites to share with your friends. There are a couple of key parts that can be done ahead of time, giving you more time the day of your party. 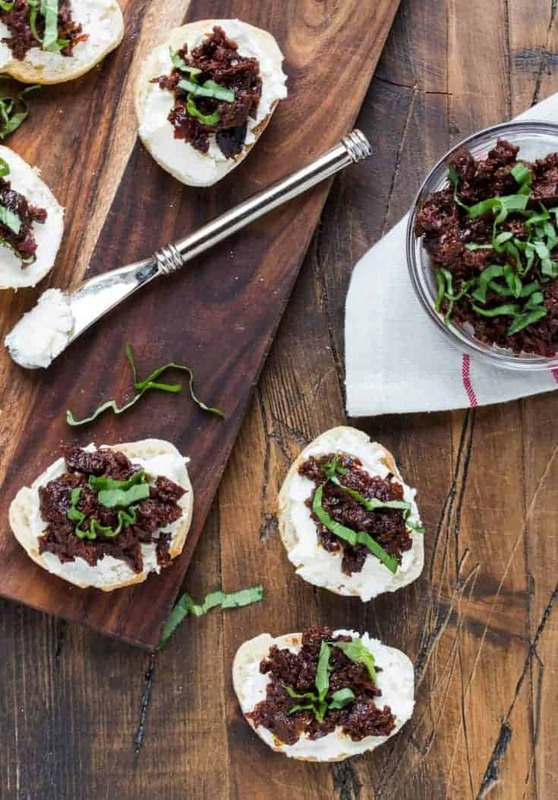 The crostini can be made several days prior and the feta cheese mixture and sun-dried tomato tapenade the day before. The more things that can be crossed off the list ahead of time, the better. Simply assemble the bruschetta shortly before serving time. The colors on the bruschetta are amazing and look fabulous with any appetizer spread. The flavors do not disappoint; it tastes as good as it looks. You will rock the hostess role and didn’t have to spend all day in the kitchen to achieve it. Time-saving tip: Set out cheese mixture and olive tapenade in separate bowls along with basil and baguette slices and let your guests do the work! This make-ahead appetizer looks gorgeous on your buffet table! Slice the bread into 1/2 inch slices and toast in oven until lightly browned (about 9 minutes). Rub the bread with one of the garlic cloves after you remove it from the oven. Can be made two days ahead, put in air tight container once it has cooled. Combine Feta and cream cheese until smooth. Put remaining garlic cloves, olives and sun-dried tomatoes in bowl of food processor. Pulse until coarsley chopped but not pureed. Slice basil in ribbons and stir into tapenade. Right before serving, spread crostini with cream cheese mixture and top with olive tomato tapenade. This is a delicious appetizer. I have served it to vegetarians and carnivores alike, and have gotten rave reviews. It requires a little cutting, but can be done ahead of time, making it a great easy to entertain with appetizer. Thanks Lisa! Thanks! I do mine in the Cuisinart….takes a lot of the chopping away! Thanks, Therese! Let me know if you make them! Love your site-I’ll spend some more time on it! I’ll do it for sure!! !I just looooove dried tomatoes!!!! Louise, thanks for stopping by! I hope you enjoy them, let me know what you think! Lovely, easy to prepare, fresh….I’ll be making this recipe for my daughter’s baby shower. Thankks for sharing this delish recipe. Thanks Cathy! Have fun at the baby shower! How exciting! I used to pass on sun-dried tomatoes but now I can’t seem to get enough of them. This is next on my to-make list! I’m pretty sure I’ll make it too early before guests come just so I can eat most of it myself! Let me know how you like it, this is one of my favorites! I made this months back, and suddenly today, out of nowhere, I was completely overwhelmed with cravings for this again! I googled and came straight back to the page just to look at it! It really is a fantastic combo, thanks for sharing. Thanks, Chris! Glad you came back and made it again! It definitely is a keeper! Love this recipe. We always have a Thanksgiving party and I think these will be a HUGE hit. Thank you! Made them, they were a hit!!!! Will make again definitely. Yay! I’m glad everyone liked them. They always disappear quickly when I make them. I’ve been using this recipe for a few years, but wanted to let you know how I’ve modified it. I usually double it and do it as a layered dip, spreading the feta cheese layer on the bottom of a dish and spreading the tomato olive mix on top. Set out a plate of the toasts or crackers and a little knife and people go nuts for it. I make it a day or two a head of time and store separately then layer just before the party. It’s become my go to, quick, easy appetizer that people rave about. Thanks! !